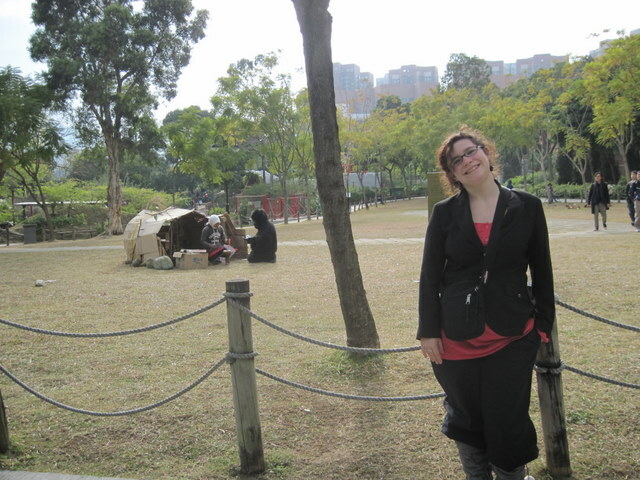 One day we embarked on an adventure throughout Hong Kong. We sought to discover two temples. Clotilde-friend from France visiting, Christy, and myself. We began with the Che Kung Temple. This temple was built at a time when the land was being ravaged with plagues and floods. People came together and built this temple and prayed for it to all be gone. They spun windmills for good luck and banged baritone drums. Soon the hardships did disappear. It was interesting to me so many fables, passages, entries etc. revolve around people coming together to worship the bad out of a particularly awful period in history and soon after the hardship slowly disappears. The reason for disappearance I believe is decency. Coming together as one people hoping for it to end instead of necessitating the dog eat dog world. We spun the windmills for good luck and admired the Buddha. This temple was small. It was still just as much lovely. We continued our journey to the second temple on our list — Temple of Ten Thousand Buddhas in Sha Tin–Man Fat Sze Monastery–though no longer home to Monks. We were following a step-by-step guide. During our walk I remarked how all my life I do things backwards. When I was young I did math problems backwards. As I grew up if I wanted to build something, I would build it completely backwards before realizing my mistake. Maybe a frontwards world is not my forté. At any rate we were following specific 1 by 1 directions. After an hour of walking we decided these directions were too difficult and to finish it by way of metro. We arrived inside a giant shopping mall. The directions talked about heading through the mall. We were still puzzled as to where we should absolutely be going so we took a meal. Soon began walking more. We stumbled upon one of the most beautiful parks I’ve ever been to. It had huge play areas for children, a big river to run near, pagodas, Chinese bridges, lakes, and even a gorilla living in a box in the middle of the park. Much to my dismay we discovered he wasn’t a real gorilla. It was an experiment called, ‘evolution in ten weeks.’ Somebody dressed as a gorilla would sit outside a few hours a day and have park-goers teach him how to do things, like making music, or building a house, creating tools, learning to say words, etc. It was fascinating I’ve never seen a social experiment of the like. His cardboard house was built of materials found only in the park that people had dumped there. We strode through the park and according to our directions realized we were getting close. Just at that last realization I came to the realization that I had in fact, with these directions too, had been reading the directions backwards! Thankfully we asked somebody and she said ‘oooh so far away you will never make it.’ We were just about to give up, but refused. We strode back to the metro and found the steps right outside that we should have been climbing. It was now 430pm and the temple closed at 6pm. We were on a march! 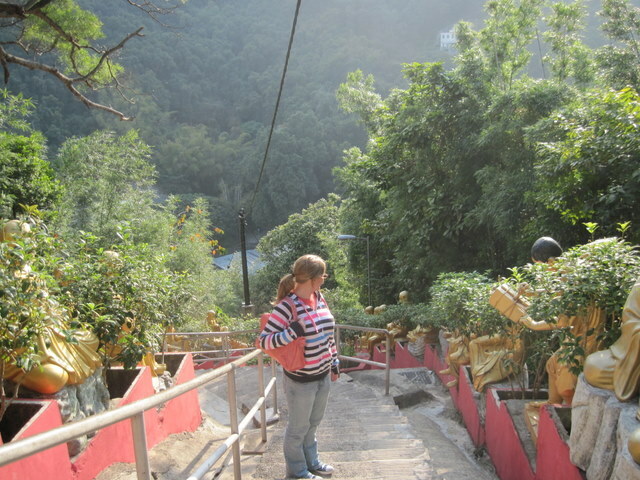 We climbed 431 steps lined with Buddhas along a hillside. It was a treacherous climb at times but the end reward was our fortune. The Buddhas were incredible and there were certainly more than 10,000. All of us were silent. We could not find any words. The views were breathtaking with the Buddhas complimenting the serenity on this peak. We came upon the main temple. Inside the walls glowed with small Buddhas lit up. The remains of the temple founder lay at the main alter. He had been embalmed and enshrined. I felt an energy surround me that I have never in my life, encountered before. That’s the only way I can describe the impact this temple had on me. We wrapped our way around to another part of the temple. An outdoor shrine with a waterfall and many more Buddhas on the hillside. Everywhere we looked there were beautiful Buddhas showing us the way. While at the outdoor Buddha shrine I remembered something in particular about this temple. Wild monkeys! I have never been in the presence of a wild monkey. Just as I remembered this little bit we began our descent off the mountain. During the first hill downwards we heard some rustling in the bamboo. We look up and a monkey jumps down! Christy and I whimper in horror and realize we are positively terrified of wild monkeys. Clotilde, being the brave French girl trudged forward. Christy and I went slow at first then began to run. The monkeys gathered inside their fence when they noticed our presence, it looked like they would form a crowd to corner us. Thankfully they didn’t and we ran down the mountain fas ter than we could admire anymore Buddhas! Sunset–we hopped the metro back to the Chungking Mansions. This entry was posted in Uncategorized and tagged 10k Buddhas temple, Chungking Mansions, gorillas, Hong Kong, lost, monkeys, temples, walking. Bookmark the permalink. Awesome! Why were you scared of the monkeys? Did they remind you of the ones in the Wizard of Oz? I’m always doing everything backwards too! I choose not to look at directions now. I always read magazines backwards!